Ever since the Nixon administration, America's objective has been: produce as many calories as cheaply as possible. In 1960, your grandparents were spending about 17.5 percent of their income on food alone. According to a new chart published by the USDA, by 2007 that amount dropped by nearly half to just 9.6 percent of household income. 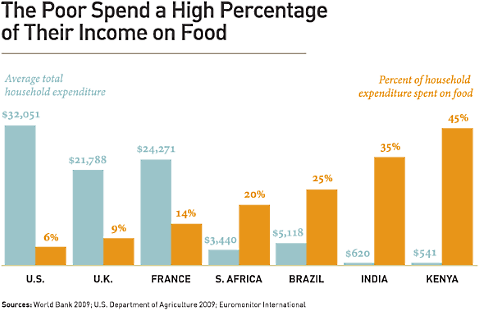 As of 2013, Americans spend 9.9 percent of their income on food. Because of the overall rise in income, and the consistent shrinking of food prices adjusted for inflation, we actually have more disposable income than our grandparents did. In 2013, the lowest income bracket spent on average $3,655 annually on food, or 36 percent of total income. People in the highest income bracket spent about $11,000 annually on food, which was only about 8 percent of their earnings. Food writers like Mark Bittman have talked for years about the decline of home cooking in America, so it probably doesn’t surprise any of us that the U.S. eats the least amount of food prepared at home compared to just about everywhere else in the world. 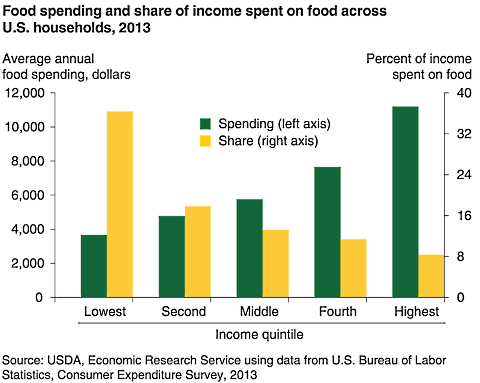 America spent about 6.7 percent of household consumer expenditures on food in 2013. Contrast that with the 14 percent spent by French and Japanese households for the same time period, or the 40 percent spent by Guatemalans. In some ways, that’s a good thing. As Mother Jones writer Alyssa Battistoni points out, spending less on food makes getting necessary calories easier for everyone, even the very poor. So how did the landscape of American food change so much in just a few decades? To summarize: During the Nixon Administration, Secretary of Agriculture Earl Butz changed America’s agricultural subsidy program to encourage production of massive amounts of corn and soy. In 1970, America produced about 4 billion bushels of corn per year. Now, we’re up to 12 billion. As Michael Pollan pointed out in a scathing 2008 NYT op ed, regardless of your personal feelings on the matter, America’s food policy for decades has been to produce as many calories as cheaply as possible. It’s easier to fill your cart with food for comparatively less money, but is that food necessarily better for you? Here’s an argument: Food is as cheap as it is because the true costs have been externalized—that is, we pay for them in rising obesity rates, environmental degradation, lax safety measures, and disgraceful labor practices.